Dr. Hema Patil has lived and studied all over the world. She traveled to New York in 2004 and received her Doctor of Dental Surgery (DDS) with Honors in 2008 from New York University. Among those honors was her induction as a member of Omicron Kappa Upsilon, a National Dental Honor Society founded in 1914 at Northwestern University School of Dentistry. Alumni Members (Associate Members) are selected from the top 20% of the graduating class, as reported to the chapter annually by the Dean of Academic Affairs. From this listing, not more than 12% may be elected each year. After dental school she relocated to Chicago where she practiced General Dentistry for over 6 years before finally arriving with her family in the Dallas area to call Texas their home. In her off time, Dr. Patil loves to spend time with her husband and two beautiful children. Along with being a wife and mother, she loves to cook and stays fit by playing Badminton. You can often see Dr. Patil active in the community and participating in Health fairs and various school events. 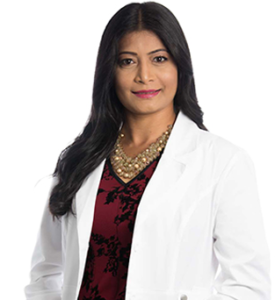 If you’re looking for a caring dentist, an experienced team, and a new, modern dental office for your family in McKinney, we invite you to come by and meet Dr. Patil and her staff. Let us show you how Eternity Dental can create your forever smile!